Last summer, I contacted favorite blogger and designer Holly Mathis and asked if she could help "spruce up" our dining room. I knew I needed a fresh perspective. I didn't know that she would totally get me after one email, that we'd become fast friends, and that the whole prcoess would be so fun. Holly is one of those rare people that is both humble and unaware of how talented she is and that makes working with her, and getting to know her, such a pleasure!
" Hi, Holly! HELP. I don't like my dining room. I've out grown the style of the furniture, but I'm not ready to invest in replacments. I'm at a stand still with what to do. I'd like to leave the wall color, window treatments, light fixtures and some of the accessorries the same." What I love about this room is the way it FEELS - classic and cozy, up to date but not too modern. I cannot tell you how much I love the room now. We do not have a formal dining room in this home so every meal is eaten here, all homework, sewing, craft projects etc. happen around this table. And while every room in our home is always evolving and changing (I'm still on the hunt for a round or oval antique dining table that can stand up to our daily abuse) for now this room is just right the way it is! this is absolutely AMAZING!!!!!!!!!!! I love how inviting it feels! great job!!!!!! Oh my goodness gracious! I am in love Tessa! Your dining room is stunning! Every detail is perfect! Now I want to paint our china cabinet. tessa it is gorgeous! every last detail is perfection! Oh my goodness gracious! So beautiful! It was cute before, but it really has that decorator look now. I'm jealous!!! And love those chairs so much. Ahhh! This is what I love about good design. The room now has a richness and invitation that it lacked before. Congratulations! Can you email me to let me know how much a virtual consult costs? partridgeathome@yahoo.com. Thank you! Beautiful. I can totally see Holly's influence in this room. She has immeasurable talent and impeccable taste. Looks timeless and cozy. I would love to curl up on one of those chairs while the kids are doing homework. I agree!!! What a difference painting that hutch made. Looks beautiful! Your room looks so beautiful! I liked the before, but it is perfectly updated now! Could you please tell me what kind of paint/color you used on your hutch? It is a beautiful color! The painted hutch and the small touches of red on the pillows matching the buffalow check with the blue on the plates totally make the room! Love it!! It looks so perfect!! Love the gorgeous chairs under the adorable silhouttes. Thanks for sharing...love your new blog look too. It's absolutely stunning! I just love it. The room looked pretty before but I love how the hutch looks beautiful with the lighter color. Love the silhouettes and the chairs are gorgeous. Your pictures are my inspiration to finish up my dining room. Thank you for sharing. What color paint is the hutch? all of you are just too sweet! thank you! the hutch color is Flagstone from Martha Stewart, but with Ben. Moore oil based paint. Grays are so tricky and this color reads MUCH lighter in my room than on the paint strip. thanks!! I'm dying right now - I love EVERYTHING!!! You have aaamazing style! Love your new blog design too!!! it looks great and is so you! It is beautiful. What a great before and after. I am in love with the painted cabinet. So happy to have found my way to you blog this evening. That looks amazing!!!! I love it all!!! I need to update my dining room. I am absolutely in love with this room! I love everything about it! Holly is amazing. So happy to stop by from her blog. Seriously beautiful! I really think this encompasses the classic style and updated elements of your inspiration photo. 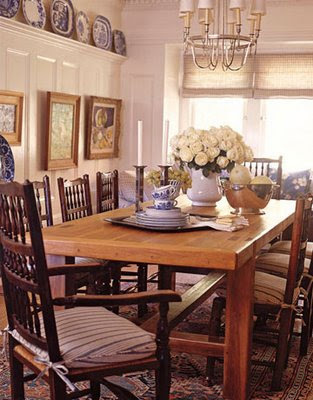 My favorite change in your space is the painted china cabinet and the upholstered chairs flanking both sides. The upholstered chairs really softened the space and added texture. I love it!! Great job to both you and Holly. I'm going to keep this simple--I love it! It looks beautiful. I also love your new blog design. Great job, Tessa! Love how it turned out. 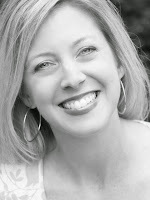 Been a follower of Holly's blog for a while and now I'll be following yours. I'm also from Cincy area. We should have a little blogger happy hour! So lovely. A great mix of beautiful and practical. Gorgeous! Everything looks so beautiful! Love your hutch painted. Did you make the silhouettes? They are perfect!!!! Isn't Holly so very talented....I loved the way you described her to a T!!! I seriously LOVE this room now. It went from everyday typical to WOWSA!!! Tessa, I saw your makeover at Cottage and Vine and was so enthralled that I had to come for a visit! Oh, you captured the look and feel of your inspiration so perfectly! I love the attractive, upscale tradtional look, that is not overyly staged. It looks like your new dinning room would be easy to live in and a joy as well! Beautifully done! I am thrilled for you! So nice to stop by today! Tessa, I have been perusing your lovely site! So many wonderful posts. I am a new follower! Such a wonderful makeover. I love the addition of the two chairs by the hutch. The fabric on your pillows is the same as my dining room panels and I covered two dining room chairs in it too. Love it. Love the hutch painted gray. Girl...she pulled it all together for you...so pretty and only a few items purchased...great makeover! I love that so many of your before pieces are included in the after. She took what you had and punched it up a bit. Well done! Oh, wow. My head is spinning, wondering how I can recreate this transformation at home. I LOVE how the chairs and the silhoutte pics flank the cabinet and that is exactly what I want to do now as well. I'm in awe of the room and of Holli!!! And your brand-new blog look is adorable! Love ALL of your transformations! Holy cow! Look at all this comment love! I love the wing chairs best of all! You and HOlly did a great job. And best of all, you have a sweet friendship because of it! I love that! Speaking of spruced up, your blog gave your blog a little kick! Like it! WOW! I love it! She took your original style and just enhanced it beautifully. This is a room that is going to feel comfortable and stylish for years. Fabulous! P.S. My sister and I host a linky party on our blog every week (Inspiration Friday) and we would love to have you join in the fun sometime! the room looks fabulous! i just found holly's blog over the weekend. i was so excited because i'm looking to makeover my dining room. what do you call the style of your black dining chairs? captain's chairs? Dining room is absolutely beautiful! So comfy and love the style. I so need to work on some updates for our home. I am blown away by all your kindness! This blogging community is one supportive bunch. You all know how to make a girl feel GOOD!! I think I answered all your quesions by including the sources at the end of the post. Jacqueline (such a pretty name) - the black chairs are reproduction Windsor chairs - I've seen them called Windsor Fan Backs or Boston Fan Backs. I cannot believe how much better this room looks and there really aren't THAT many changes that were made! Who would have thought that the addition of some easy chairs would make such a difference? And I love the color of the china cabinet...I thinkk that makes the biggest change. It is a beautiful room now. What a great transformation using your existing items! Love the hutch in that color! The chairs on either side of the hutch are lovely -- are they new? Nice job! I just found your blog trough Cottage & Vine. I'll be back! I am loving this redesign! This is my first time to your blog. I found you through Holly's blog. Can't wait to check out the rest of it! And I am your 100th follower! How gorgeous! I LOVE the blue willow transferware. It always make a room look classic. I just discovered your blog and look forward to reading all your older posts. wow! what a transformation. don't you just love it? it's so fresh and inviting...great job! I love your transformation.......When can I move in!!!! All joking aside...I have a wing chair that I want a slip cover made for and love yours! Would you mind to share what type of fabric that you used and if that is ribbon or the fabric at the bottom? Never posted in my life...found this page through Holly's....I LOVE IT!!! Kudos to both of you!!! Looks fantastic! Just beautiful. You really did a great job. Me again. Just wanted to let you know that I've linked your site on my blog...hope you don't mind. I am in love with your dining room! Lovely. I love the hutch and needed a kick in the rear to paint some of my old furniture that I don't love anymore. I think the painted cabinet makes the whole room...love it, looks lovely! You have great taste, I love the wings on either side. Love your blog. Beautiful, Beautiful! I'm loving those comfy chairs - they are perfect! Dining rooms are usually not my favorite room...but yours has changed my mind! Loving the painted china cabinet - it's funny how a coat of paint can change everything! Enjoy your beautiful room! Wow! I love it!! Great details and those chairs definitely make you want to stay a while! Just thought I'd stop by after seeing you won on Claudia's give away and she is right, your dining room his TDF! I'm so glad I did because I love the dropped leaf round barley twist table vignette (did I spell that correct?) and think I may possibly have to steel that idea for a spot in our dining room. This looks like a room you never want to leave! This room is just beautiful!! What color did you paint the ceiling? Love it all. LOVE IT! I have found (craigslist) some wingback chairs, and would love to copy your slips. Could you, would you, email me (ahburkett@gmail.com) with details? Are they skirted to the floor? Gathered all the way around? Help!! (If you have a moment, if not, I'll be chasing my two little ones and will totally understand)! I love the simplicity of your hutch and am looking for something like that. Did you happen to purchase it anytime recently and if so, do you mind sharing where you found it? All beautiful...thanks for sharing!! LOVE your dining room!! A few wingback chair questions for you.... Do you have someone you recommend for making slipcovers? Would you mind sharing what fabric you used? Also, are you able to use the wingbacks at the table, or are they low? I have recently found a pair that I'd like to use as host/hostess chairs, but they sit rather low. Wondering if I could have the cushion beefed up somehow to sit higher. Would so appreciate any info you're willing to share! What color did you paint the beautiful Hutch? Please share!!! What size are the silhouettes?? They are in perfect proportion to the chairs and hutch!!! Hi Tessa! I'm assuming the frames are 18x18 which would mean you ordered the 11x14 silhouette size? About to order some from cutarts and yours fit the frames perfectly! Thanks! I told him the frame size and he made silhouettes accordingly. Custom size. Enjoy yours!! Your dining room is beautiful. I would love to know who made your slipcovers. I live north of Cincinnati, closer to Dayton and have been looking for someone local to make some slipcovers for me. My email is nicolelynn1228@yahoo.com. Thanks! I'm seeing more and more of the silhouettes. They are very pretty and I love your blue and white pieces! I love your dining room. My home is a young 112 years and we have been renovating for the past year. I, too, long for that classic style updated to today's needs. Our home also has just the one dining space, and I am inspired by how you did not allow the every day use to dictate the room. I think it is balanced very well and can be used for upscale events as well as every day. The homey and cozy feeling is also there. Thank you for sharing! It's beautiful! Is that a 5ft table? Could you please tell me how tall your hutch is? I am looking for one and that would be the perfect size. Aggggggg. Just lost my post. I love your house - especially your lovely dining room make over. I was wondering where you got your kitchen shelf brackets. I love them. I just subscribed to your blog and can't wait to see more. I am always confused when select profile comes up. I totally don't know what this means and don't know what applies to me. I obviously just tried one and lost my post - cross your fingers - select profile here I come again. Could you tell me the dimensions for your china cabinet? I LOVE your blog!! You inspire me!! I love your taste (and Holly's , too!). I have pinned so many ideas from the two of you over the last two years that it's ridiculous! Just wondering if you could share how/where you obtained that Chinese vase (the one with the beautiful hydrangeas and roses in it!) in the above pics? Been looking and can't seem to find one that pretty!! Thanks sooo much for any info that could help me locate a good one, too! Cheers! Thanks so much! Sadly, the vase is an antique. If u are local there is a great selection of blue and white jars at Federation Antiques in Hyde Park. Also, Wisteria online has some pretty new ones too. Good luck!